There was a lot that went wrong for the Dodgers in their 6-5 loss in game 1 on Friday night. Clayton Kershaw pitched terribly. Yasmani Grandal had a historically awful game, (two passed balls, catcher’s interference, and missed catch error) and the defense fell apart. Despite all of those disasters the Dodgers still rallied and only lost by a run. During game 1, Milwaukee had emptied and burnt out their entire bullpen. Josh Hader was not available to pitch in game 2, and the Dodgers would easily have an advantage with Hyun-jin Ryu starting against Wade Miley. Things don’t always go as planned in the postseason. While Miley had the game of his life, pitching 5.2 shutout innings and going 2 for 2 with a run scored at the plate, and Ryu was knocked out of the game in the fifth. The Dodgers eventually rallied in the later innings. The boys in blue scored twice in the top of the seventh, and two more in the top of the eighth led by Justin Turner’s beautifully clutch two-run shot. The Dodgers held onto to win 4-3, tying the series as it shifts to Dodger Stadium on Monday. The Dodgers looked defeated and exhausted against Miley in the opening innings. Poor approaches and weak contact plagued the Dodgers in the first five innings. Miley who looks like he just stepped off the bus from shanty town, used his improved pitching weapon, a heavy cutter to keep the Dodger lineup off balance. The Dodgers had just two hits against Miley, who finished with three strikeouts and no walks. Note that the Dodgers went with their all-righty lineup again as Yasmani Grandal was benched in favor of automatic out Austin Barnes. Max Muncy, and Cody Bellinger were both on the bench as well, but both players got into the game in the later innings. The Dodgers had trouble with Miley, but it appeared that David Freese had hit a home run over the right center field wall. Unfortunately that darn Lorenzo Cain leaped above the wall to rob Freese and make the catch. That was about the Dodger’s only scoring chance against Miley. Meanwhile Ryu was fine through the first four innings, as the game remained in a scoreless deadlock. But the fifth inning was Ryu’s undoing. With one out, Orlando Arcia bombed one over the wall in center to give the Brewers the 1-0 lead. Things didn’t get any better for the Dodgers in the frame. Miley singled, and then Cain’s slicing double down the line in left advanced Miley to third. That was it for Ryu, who lasted just 4.1 innings, as Ryan Madson was brought in and intentionally walked Christian Yelich to load the bases. Ryan Braun’s soft grounder scored Miley to put Milwaukee up 2-0. Madson would strike out Aguilar to end the inning. In the bottom of the sixth, Travis Shaw homered off of Alex Wood, (That’s two consecutive home runs allowed for Wood) and that gave the Brewers a 3-0 lead. It almost seemed insurmountable at that time with the Dodger bats cold for most of the game. However Milwaukee would remove Miley in the sixth, replacing him with Corbin Burnes. The Dodgers with a different look would finally wake up. In the top of the seventh, Max Muncy drew a pinch-hit walk and Manny Machado singled him to second. Cody Bellinger’s RBI single to center would plate Muncy to cut the Milwaukee lead to 3-1. Jeremy Jeffress would replace Burnes and Joc Pederson’s bloop single into shallow right field would load the bases for the Dodgers. That brought up Yasiel Puig, who impatiently whiffed, breaking his bat over his knees afterwards. That next brought up Austin Barnes. The Dodgers were out of position players. With nobody left on the bench (Grandal would have to bat for Wood) the Dodgers had no choice but to let Barnes bat with the bases loaded. The best possible outcome for everyone was if Barnes walked. The count went to 3-1 and Barnes took for ball four, forcing in a run and making the score 3-2. But Grandal’s awful series continued as he immediately grounded into an inning ending double play. After Pedro Baez (now trustworthy in the late innings) tossed a scoreless bottom of the seventh, the Dodgers mounted another rally in the top of the eighth. With Jeffress still on the mound, Chris Taylor’s dribbler was hit softly enough to allow him to reach. That was vital as Justin Turner smashed a 2-0 hanger into the left field bleachers to put the Dodgers ahead 4-3. 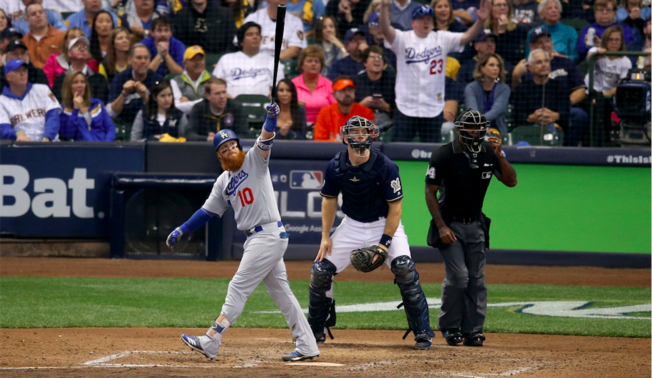 Turner, the heart and soul of the Dodgers pointed his bat upwards in triumph as Miller Park fell into silence. The Dodger dugout exploded with fist pumping and imaginary selfies. Incredible! Move to the bottom of the eighth. The Dodgers now up 4-3, desperately needing to hang onto the one-run lead had Baez record the first out, a strike out of Domingo Santana. Baez pumped his fist as Dave Roberts came out of the dugout to remove him. In came Caleb Ferguson. Fergie walked Mike Moustakas, but got Shaw to ground into a force out. Kenta Maeda was the next up, and faced former Dodger Curtis Granderson. I was in disbelief that Granderson was still playing but there he was at the plate with a chance to ruin the Dodgers. Granderson drove a long drive to right, but thankfully Puig caught it near the warning track and the Dodgers got out of the inning unscathed. Fast forward to the bottom of the ninth. With the Dodgers still leading 4-3, Kenley Jansen got the call to close it out. He gets Arcia to pop out for the first out, but walked Hernan Perez. Kenley recovered to whiff Cain, but that would bring up Yelich representing the winning run. After Perez stole second base, Kenley got Yelich to ground out to third and end the game. Dodgers win it! Looks like the vaunted Milwaukee bullpen has sprung a leak. Perhaps the Brewers should call a plumber to fix the hole. The NLCS will shift to Dodgers Stadium for game 3 on Monday night. Walker Buehler will take the hill for the Dodgers as Milwaukee will counter with Jhoulys Chacin. First pitch is scheduled for 4:39 PM PST. We have a series folks! Go Blue! Huge, huge win by the Dodgers. Ryu pitched a great game. Showed a lot of composure. Only 4.1 innings, but good, quality innings. Bullpen to the rescue, except for Wood’s goof. Jansen looked a lot like the Jansen we know. What can you say about JT? After a rough outing in game 1, he comes back full of redemption. You cannot keep a good man down. Austin Barnes did a great job behind the plate. Called a great game. Just might have to sit Grandal in game 3. What a key at bat for Barnes, drawing an RBI walk with bases loaded. Grandal would have whiffed for sure. Grandal did manage to kill a rally, by GIDP. Bellinger coming off the bench for a big RBI hit. DR seemed to play his chess pieces right today. Counsel’s strategy seemed to backfire today. His bullpen is weary now. Big contributors…. Pederson 2-2, Muncy 1-1, CT3 2-4. Things looking good for the Dodgers coming home for three. Now a 5 game series “with” HFA. Go Blue. One game at a time. If I was not bald already I would say these kinds of games will make me grey. But since I am both, they just make me nervous. Can Jansen ever come in for a save and just face 3 hitters instead of walking a guy who can’t hit my grandmother? Well he managed to get the job done. Nice win. They were over matched by Miley. The Brewers bullpen strategy cost them this one. Miley owned them. Thank you Craig Counsell. Now on to LA. Dodgers have home field advantage now and Buehler ready for game 3 with Hill up after that. Win the next 2 and really put the pressure on the Brewers. Chacin on the bump Monday, he was the starter when the Dodgers scored 21 runs against the Brewers earlier this year. They hit 3 dingers off of him. Pederson and Puig each hit 2 that game. Joc got a couple of bleeder singles in this game, but what ever you can do to keep the line moving works. Is there any less clutch hitter on the Dodgers than Yasmani Grandal????? This guy over the last couple of weeks has been abysmal. I would take Barnes weak bat and exceptional defensive skills over Grandmal any day. Besides, Barnes does have good at bats. He just had a bad year. Last year, he was the starting catcher for most of the playoffs. Good to see Bellinger get off of the schnied. Machado is the laziest player out there. Did not hustle on that slow ground ball and if he had busted it out of the box, he might have beat it out. Bet Roberts has a talk with his so called super star. Guy has 3 homers in the playoffs and 9 ribbies, but he is hitting under .240. The Smirk. Can’t wait to see what he does next. Hint: They don’t care about Batting Average! Hint: Michael Norris cares about Batting Average! Double hint, I care less about what you think about what I care about. And whether you or the powers that be give a crap does not matter to me one damn bit because the last time I checked, they put a players batting average on the back of their cards. Not WAR, or OPS, or OBP or any of the so called important stats to a saber geek. They put wins on there, not quality starts or WHIP. So young fans just learning about the game are taught the basic stats. The ones that for over 100 years have defined the game and made it great. So stuff that in your Funk and Wagnall’s. Since you seem pretty uneducated to older things….that used to be a dictionary that people would go read to learn stuff. You might try one sometime. What in the world are you talking about?!??!?!! I didn’t say one thing about what I think about what you care about. Not one word. Is your second point that because a stat is on a baseball card means it’s relevant? i generally like your posts, this one was really weird. Bluto, there are a lot of fans that feel the stats you and the FO care about are irrelevant. People who buy into saber metrics are not the end all know all, and Topps has been making baseball cards since 1951 and not seen a reason to change what they put on the back of the card even thought the front offices in todays game do not consider those stats relevant, they do, so yes, because they are on the back of the card, that makes them relevant. You tell me what 6 year old understands all that saber talk, none. They do not care about OBP because they cannot see it. But they can see on the back of their pack of Topps baseball cards how their favorite stars are doing. And just because you might think my post is weird, does not mean it is. Your belief that the new stats and ways of evaluating players is not something everyone agrees with. Yes, it is the way front offices view things today, and the way they stock their teams and the stats that drive them to draft certain players. Some skills are high value skills. To them anyway. You buy into all this stuff. I do not. I think the way the game was played and how players were evaluated was a lot better. You did not see players who struck out so much get as many at bats as these guys do. It is all about launch angle and exit velocity, spin rate, pitch framing, it is not about fundamentally sound baseball. No matter what era one likes, in order to be successful, you still need to throw strikes, and a hitter still needs to hit a round ball with a round bat and hit it square. I dislike the saber way of evaluation. That’s all there is to it. Something I would like to say to you Bluto. You are a passionate fan and a FAZ believer. That is your opinion. The thing is that all of us have opinions and takes on what we think should or can be done. Just because you do not think that way, well it does not make it wrong thinking. I have seen some people come up with the worst trade ideas over the years, or because they do not understand how waivers or guaranteed contracts work they will say, oh just get rid of him, when it is not that easy. And FAZ has surprised me a few times, like trading for Kemp and actually going out this year at the deadline and getting a real run producer. Even though Machado has been no where near the player he was in Baltimore. He has not really played like that guy, oh he has had a couple of spurts, but nothing spectacular like one would expect from a player with his amount of talent. And I was also very surprised when they ate a full year of Carl Crawford’s deal. That was a lot of money. The point is that just because someone does not buy into your belief system, you really should not put them down just because they think the way they do. Look, I do not always agree with everything Pack says about Roberts, but in his eyes, that is what he sees. Whether he is wrong or right makes no difference. As a Dodger fan he feels that Roberts is not the greatest manager in the world. And on some points, I think he makes some sense. I do not feel that Dave is a very good in game strategist. I think he wastes players sometimes, and I really think he relies on his bullpen way too much. A lot of fans said the same things about Mattingly. Anyway, I respect your opinion, although I do not always agree with it and I probably never will. I read your posts first because they are comprehensible and come from a rationale place. Package and that other guys’ theory of a conspiracy against Matt Kemp is so ludicrous it deserves ridicule and repudiation IMO. I don’t think the way the game is played now is necessarily great or fun to watch. I don’t think I’ve ever, EVER said I do. The new stats resonate with me because they help me understand the decisions and analysis that surround the game. I liken it to learning the fundamentals. This is how the game is evaluated, it helps to understand that. I still, despite my best efforts, am unsure what relevance the stats on a baseball card have. They are a commodity more and more purchased by collectors for nostalgic purposes. You don’t fans are more likely to follow the game online, or to learn about the game from little league or websites, right? Michael n you tell him some fans are getting caught up in this cyber BS. Michael, can you translate that into English? Bluto, translation, he meant saber BS. Also, did you ever notice that for the most part, you are the only one on here who buys into the blue cool aid? As per the post above both you and I are amongst the very few here who can compose rationale thoughts and arguments, but we both still post. Why is it Kool Aid if the team is constantly considered one of the best performing and best run? Wouldn’t it be common sense? Red Sox lose, USC rolls, Manny does not run out a grounder and gets called out by a Hall of Famer. Jim Palmer no less. Poll. Who would you rather see at SS next year for the Dodgers, Machado or Seager…..I’ll take Corey any day. Michael, yup “The Smirk” once again shows his true colors. He is like a mistery bag…. you never know who will show up. Seems when things are not going well for “ HIM” he drifts away into his little cocoon. Not a team player. I definitely cannot wait until Seager gets back. Dodgers do not need to resign him. On another note, I am extremely leery about the coaches for the pitching staff. The Dodgers seem to lean towards signing rubber arms, which they feel they can rehabilitate and resurrect their careers, at a bargain price, rather than picking up some bonafied, proven relievers. Then, when you think about who they have already. Two All Star starting pitchers, with dead arms, wasting away in the pen (Wood and Stripling) A potential superstar (Urias) who was coddled with kid gloves, eventually leading to surgery and question marks. Then, to top it off, they have to demote Maeda to the pen, because there is really nobody else they can trust with the roll of setup man. And Jansen’s roller coaster of a season, much of the blame going to the the Dodgers’ lackadaisical approach to Jansen’s spring training regimine. Jansen does seem to be finally getting his mojo back, but still is not 100%. I know he has health problems, but throwing an unprepared Jansen out there to save games, did not help his heart problems. He was not prepared to do his job, and I am sure this was very stressful for him, as it was for the fans. Just my thoughts, I may bet creamed by Dodger fans for saying this, but it is what it is. It is not so much on Honeycutt as it is on the thinking in the front office. These guys since they have taken over have consistently searched the waiver wire and found the kind of pitcher they covet. They are more miss than hit. They like low risk high reward guys. Honeycutt has turned around some careers and done pretty well. His staffs are consistently at the top of the leagues ERA leaders. Neither Stripling nor Wood have dead arms. Stripling and the coaching staff believe he was tipping his pitches. Wood, I think his problem stems from the fact that he has changed his delivery so often that he does not get into a rhythm very often. So he hangs fat pitches in the zone and they get tattooed. He has good stuff and a funky delivery. But he can come unglued as fast as any of them. As for Urias, you have to remember how young the guy still is. He has always had great stuff and a good makeup. But, he had a problem with his eye that required surgery, it’s called lazy eye. He developed a shoulder problem, and that required surgery. And through all that, he still has great stuff and is a very young guy. I have no problem with the rate at which they have brought him along. Next year, he will be a major piece of the pitching staff. Maeda is in the pen because the guys they have signed, or acquired by trade or waivers, have not performed or are injured. Just look at the so called late inning guys who are not even on the 25 man playoff roster…..Fields, Cingrani, Alexander, Chargois, Goeddel, Axford. Those guys all are supposed to be filling the role that Maeda, Wood, Ferguson are filling now. And all of those guys are way more experienced at doing that job than those three I mentioned. And I did not even mention, Garcia, Hudson, or Koehler who was signed to fill that role originally. Nor Liberatore, who over the last 3 seasons has been a mainstay in the pen when healthy. They have guys pitching out of their comfort zones. I think also that some of Wood’s problem is in the fact that he really dislikes being a reliever. He made that abundantly clear the first time they tried that with him. Maeda to his credit, makes the most of it. Ferguson is going to be a starter somewhere down the line. I think he makes Wood expendable this winter. He has better stuff and a bulldog attitude you rarely see with young pitchers. Yeah, it’s a pretty horrible take. How are Wood and Stripling wasting away? Do you think they should be starting over Hill, Kershaw, Ryu and Beuhler? But wait. There’s more silliness, that coddling Urias led to his surgery? You mean they should have used him more?!?!?!?! If the staff gets demerits for Jansen’s poor season, shouldn’t the same staff get merits for Jansen’s previous great seasons? Wasn’t it this coaching staff who turned Wood and Stripling into All-Stars? Or are they only coaching when things go poorly. Perhaps they are doing nothing with Buehler or Ryu right now, only waiting for them to reach an apex to begin coaching? I am sorry you do not buy my reasons for Kemp not playing as much as he should but I frankly cannot figure anything else. If a player has good stats and has been a good teammate why would he not play? His numbers are better than the ones replacing him. So rather than down me, why don’t you give some good information? But you go ahead and jump on me big boy as you do not have the smarts to give a lodgical reason. His numbers are not good in the 2nd half of the season. I have posted them before. And his defensive numbers have never been good all year. Defensive metrics are goofy to me, but I’ve never heard anyone (outside of this board) claim he was anything but below average. What more reasons do you need? Please repost the numbers you refer. I am not seeing the 2nd half as bad as you. Better than Joc. Kemp had a bad August but his other numbers are good. You must not pay attention to RISP. He led the NL in a good portion of the 1st half and led the Dodgers all year. Let’s hear what numbers you use to make your claims? Here’s my thinking, and I may have this wrong. That doesn’t, as written before, account for defense. Which is bad. Package, the wRISP statistic is probably more of an incentive for using Kemp as a PH. Because you aren’t always, obviously, coming up with runners in scoring position. Excellent points, Michael. It is amazing just how many arms the Dodgers have gone through this season. That bullpen does not have a gate, it has a revolving door. I do not think it is Honeycutt. It is his support staff. Seems tipping pitches has been an Achilles Heel for the pitchers recently, and the constant changes with their deliveries, really, like you say, makes the pitchers uncomfortable. This, to me, is atributed to the coaches inability to fix problems before it is too late. Once a player develops bad habits, it is hard to correct them. True with pitching, as well as hitting. All in all, I like the Dodgers’ chances, now that they have grabbed HFA. I see this going seven games, Dodgers taking two of three at home, then one of two remaining in MIL. The best case scenario is for Dodgers to win the next 3 games at home and win the NL Pennant in front of the home crowd instead of on the road, like last year. Yep, that is the best case scenario, lets just hope the Brewers can’t solve Dodger pitching. They have been pretty good against Yelich so far, but he rakes at Dodger Stadium, always has. This is an entirely new coaching staff under Honeycutt. They lost all their entire staff from last year. Wood and Stripling are All-Stars who have totally nosedived in their careers this year. I blame the current coaching staff, led by the “New” Bullpen Coach Mark Prior. Is it just a coincidence that Wood and Stripling both lost their mojo, with the new staff changing their deliveries, and mechanics? I don’t think so. This new staff was also responsible for Jansen’s spring training regimen. Buehler’s success is due to his own abilities and confidence. Ryu will be a free agent, so he has a little personal modivation to do well. As far as Urias, yes he had his eye problems. Arm issues could have been attributed to his training regimen last year in Camelback, which went on during the season. I’m not saying Urias’ setback is positively a result of his coaches, but it just seems logical to me. Honeycutt needs to find a new staff, for next year. Actually Blue, this has been a good year for Stripling. He was mainly a reliever last year and stepped in and was a glue for the starting staff and it got him an all star bid. Wood obviously regressed. He was 16-3 last year and no where near that good this year. He was 9-7 and his ERA is close to a full run higher. Stripling is 8-6, but lost 4 straight games since the all star break. He also had a DL stint that probably messed up his rhythm. This is Striplings first year with a winning record. As far as Honeycutt, he really has no staff. You have Prior who is the bullpen coach, and then the BP catchers, but Rick is pretty much it. The trainers are responsible for the players health and anything that has happened per Urias is on the training and medical staffs. Wood gave up only 5 homers last year, he has given up 15 this year plus 2 in the playoffs. Stripling gave up 10 homers last year and 18 this year, but he obviously has pitched more this year. Honeycutt has hinted at retirement the last couple of years and this may be the year he does it, especially if the Dodgers can pull off winning a World Series. They will not redo the staff only a year after just hiring these guys. You’re blaming the bullpen coach for the regression of the starting pitchers? You’re blaming Urias’ shoulder capsule surgery on a training regiment by the coaching staff? You’re crediting Buehler’s success to himself not the staff? You’re crediting Ryu’s new pitching strategy to his pending free agency? And because of that you want people to be fired? Points well taken. Yes, Strips had a decent year, thanks to his fast start before the All-Star break. The second half nosedive is what killed him. Wood is totally lost. Bullpen coach’s (pitching and catcher) are responsible for getting pitchers ready to come in, in relief. Probably also responsible for getting the starters ready. Seems half the time (maybe more) this year, the relievers came in and were not ready, mechanically, and mentally. Lots of meatballs served up out of the pen. Also might blame Grandal for his poor pitch calling, and inability to get on the same page with his pitchers, especially with all the pitching changes that have occurred this season. It is important that the pitcher and catcher are in sych. Grandal has definitely had his problems with the starters, then to add all the different arms coming out of the pen, could be more than he could handle. Something like 28 different arms used this season? That is rediculous. Just thinking, I think Wood went from pitching from a windup with no one on base to pitching from a stretch all the time. I also think his funky windup made it hard for hitters to see. If I am right, it could cause some of him being less effective. Check with Michael on that, but I think that is correct. Much smarter than I thought. You are a genious to figure that out!,? Package, I believe you are correct. Correct me if I am wrong, Michael. Just a prime example of pitching coaches trying desperately to fix a mechanical problem, and messing with a young pitcher’s mind. Wood’s delivery was definitely funky. It confused hitters and was probably part of the reason he kept hitters off balance. But, the decision to scrap the windup was his. His mechanics were such that every one believed they would lead to an arm injury. Coaches just suggest. Wood accepted the changes and he pitched well at times. He scraped the wind up last year and it was a huge part of what made him so effective. But somewhere along the line, he lost the rhythm he had last year, and this year he would be ok for a few innings and then boom, he would lose it. Not sure of the reason, but he would serve up some fat pitches and be out of the game. Wood has 2 full seasons under his belt as a Dodger. He has parts of 2 others. The year he was traded, 2015 and 2016 he pitched in a total of 26 games as a Dodger, 22 of them starts. His record was 6-10 over those 2 seasons and he gave up 12 homers. Over the last 2 seasons, He has pitched in 60 games with 50 of them starts. He is 25-10 in that time and has surrendered 29 homers. The staff as a whole has served up more long balls. 7 pitchers gave up Double digits in HR’s. Of those, all were starters save Jansen who gave up 13. Ryu gave up 9 in 15 games. Only Hill gave up 20. Then it was Stripling, 18, most of those over the last couple of months, Kershaw, 17, Wood, 14, Jansen, 13, Maeda, 13 and Buehler, 12. Last year Kershaw, Maeda and Ryu all gave up more than 20. But remember, HR’s are up all over the majors. The Dodgers set a team record this year and the Yankees smashed the MLB record. 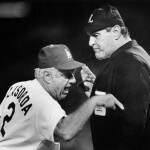 And although the coach in the pen, Prior, gets the pitchers up and they prepare to come into the game, who comes in and in what kind of situation is squarely on the manager. Pitchers are creatures of habit. All you have to do to understand that is listen to Orel, or during these games, John Smoltz. They have a routine and they like to stick to it. Verlander is a prime example. Most pitchers, especially when they come to a new organization go through a process with the pitching coach and staff and it is a get to know each other kind of thing. The responsibility to be ready to pitch is on the player, not the coach. Have you even noticed that some guys get ready really fast. Others, like Maeda, who is basically a starter, take a lot longer. I think that is one of the reasons Wood is so unreliable out of the pen because it is not the way he is used to getting ready for a game. So the onus to perform, and Roberts has been using him as a lefty specialist, to get out tough left handed hitters, is on Wood. He dislikes the role, and he is terrible at it. Look for Alexander to be back on the roster if they get to the series, and Wood left off. The players are the ones who must take responsibility for their performance on the field. Oh yeah, last year only 1 Dodger pitcher did not give up a homer all year, Morrow….then he gave up 2 in the series. You can blame it on a slump, blame it on the summer weather, blame it on whatever you want. Kemp’s OPS (which combines OBP and SLUG) was lowest among all the other OF. You can say “They do not give up that much defensively when Kemp plays over Pederson” but I don’t think you are in the majority. There is a rationale reason why Kemp didn’t play in the 2nd half. It’s not some lame-brained conspiracy theory. Not some silly result of playing Fantasy Football with the wrong people, and not because the manager doesn’t like him. It’s very hard to read your single paragraph posts, Michael. But I think somewhere in there you claimed the Internet was too hard for kids to understand. I have no idea what that means, but I’m 100% sure more kids are following baseball online than through baseball cards. Please don’t tell me you feel otherwise. Finally, you asked: who do you want at the plate with the winning run in scoring position and 2 outs? Probably Turner, but Kemp would be high up there. And I bet the team would too, as a PINCH HITTER! Well there you are, you said it all, you don’t know anything. I did not say the internet was too hard for kids to understand, I said saber metrics are. And a lot more people buy baseball cards than you think. Just go look at a baseball card convention. As for Kemp, what ever the reason he has not been played, it is not a good one. Joc has made 1 error, Kemp 2. Not much difference and they are real close in assists and chances. So personally, I think your theory’s are all wet. Batters who have higher batting averages hit more. They have a larger chance of success. Look at it this way, I will make it easy for you since you seem to not grasp the math. 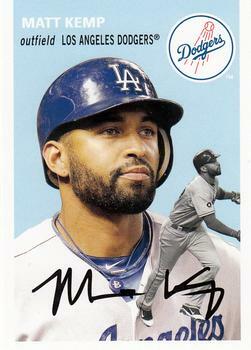 In 100 at bats, Matt Kemp is going to get 29 hits. In the same 100 at bats, Joc Pederson is going to get 24.8. Kemp is a better hitter. Kemp drives in more runs, runs win games. So Kemp should be playing. End of argument. Kemp has not played in this league 13 years because he is marginal, he has played 13 years because he produces runs, and lately, I do not see this offense knocking down walls. As a matter of fact they are doing little damage at all, especially tonight. Look, you believe your way is the best way, Fine, I disagree, you already said it was not a very exciting brand of baseball, that I do agree with, it is excruciating to watch these guys flail away night after night, and if the 9th inning of tonight’s game is any measure of how good they are, they have ZERO shot at getting back to the World Series with this bunch. They were pitiful, and Grandal led the charge by striking out not once, but twice with one out and the bases loaded. He is FAZ’s atypical Saber type player. Boom or bust, and he is mostly bust. And oh yeah, I just proved with one of your own saber stats, BA with RISP that Kemp is far and away the best hitter in that situation and you still want to relegate him to being a pinch hitter, sorry dude, that’s moronic thinking. 2)Batting Average! YOU, Michael Norris himself, have already admitted multiple times that you understand the people who decide to sit Kem in lieu of others value newer more definitive stats much more highly than BA. If we are trying to discern why Kemp isn’t being played by certain decision makers, we need to look at things through those decision makers’ vantage. 3) Thinking Kemp is not and has not been a marginal player in recent years. The Dodgers couldn’t trade him last off season. That wasn’t because he was full of value. The Braves traded nothing for him, and then couldn’t wait to trade him again for nothing. I haven’t even mentioned the Padres rush to get rid of him. He was marginal and trended back to marginal. According to some recent web articles, the average age of a current day card collector is 37.5 years.